Every Christian has an enemy. Although unseen by the natural eye, this adversary is not imaginary nor a mythological character. Satan, the Devil, is a real person... a spirit being, with intelligence, tangible characteristics, and whose incessant goal and ambition is to steal, kill, and destroy (John 10:10). Regardless of whether you realize it, Satan has targeted you as a victim. He knows your name and address, your strengths and weaknesses. Somewhere in the shadows, he and his forces lurk, waiting, planing for the moment they will strike when youre caught off-guard. He desperately hopes that you will, as many Christians, remain ignorant of his reality so that youll blame his assaults on somebody or something else. His method of operation is almost always undercover. Subtly, he manipulates hindering circumstances and inspires evil thoughts or temptations, disguising his activities behind the shroud of people or things. He will always seek to divert attention and blame for his actions upon others. But make no mistake, he is the real enemy, not your husband, wife, employer, government or Christian brethren!For we do not wrestle against flesh and blood, but against principalities, against powers, against the rulers of the darkness of this age, against spiritual hosts of wickedness in the heavenly places (Ephesians 6:12). The good news is that, although the Devil is described like a roaring lion, in reality he has no actual authority over believers. 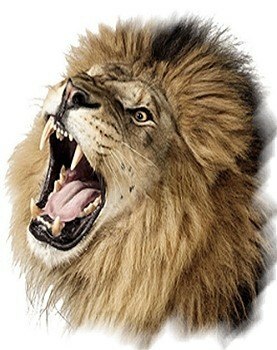 He is not really a lion, but roars like a lion would to bluff his victims into fear and intimidation. Satan is a liar and deceiver and uses deception as his weapon to gain advantage over those who are ignorant of the limitations of his power. When Jesus gave his life on the cross as the sacrifice for the sins of the world, He also redeemed us from Satans power and dominion over us. Having disarmed principalities and powers, He made a public spectacle of them, triumphing over them in it (Col. 2:15). ...For this purpose the Son of God was manifested, that He might destroy the works of the devil (1 John 3:8). Praise God! Satan is already a defeated enemy! His legal authority was neutralized by the finished work of Christ on the cross. So if Satan is already defeated, why then is he still able to cause trouble? Because, even though Christ broke Satans legal power, the Lord has left it up to us to enforce the Devils defeated condition. It's our responsibility to use the authority that Christ has given us to put Satan in his place. As a believer, you need not fear Satan, but realize and exercise the authority which God has given you over the Devil. Every person whose name has been recorded in the Lambs Book of Life (all those who are saved) have been given authority over the power of the Devil. Behold, I give you the authority to trample on serpents and scorpions, and over all the power of the enemy, and nothing shall by any means hurt you (Luke 10:19). You have the right to use the authority of the name of Jesus to repel and drive Satan out of your territory and to break his grip over spiritual strongholds (2 Cor. 10:4). When you recognize Satans activity and covert operations, take authority over him in the name of Jesus! Just as Jesus and the early apostles did, command Satan to leave (Mark 16:17). The Devil hates the name of Jesus and detests an atmosphere of praise and worship which exalts the name of Jesus. Christ said, For where two or three are gathered together in My name, I am there in the midst of them (Matt. 18:20). Be assured, the presence of Christ will expel the presence of Satan. Lifting up Jesus in praise will send the Devil running! The name of Jesus will drive Satan away. But it would be futile to order Satans departure if we leave the door wide open for him to flourish. The Bible tells us to not give place for the Devil (Eph. 4:27). That is, provide no area of your life where Satan can be comfortable or establish strongholds. The enemy can always be found working in those who entertain sin, disobedience, rebellion or a self-willed nature. Unforgiveness toward others is another area which Satan flourishes (2 Cor. 2:11). Furthermore, any area of your life which is not submitted to God is considered open territory to the Devil, and he has the right to bring his expanding influence to those areas. This is why the scripture says, ...submit to God. Resist the devil and he will flee from you (James 4:7). The only way to actually resist Satan is to submit yourself fully to God. This was what Jesus was referring to when He said, ...the ruler of this world is coming, and he has nothing in Me (John 14:30). Jesus had submitted himself to God, and although the Devil would try Him, there was nothing for the Devil to use to gain an advantage. Rejoice Christian! God is in you, and YOU have been given power over the Devil! By submitting to God, and exercising your authority in the name of Jesus, you are more powerful than the enemy. ...He who is in you is greater than he who is in the world (1 John 4:4). This article (VL-134) is copyrighted © by Dr. Dale A. Robbins, 1990-2019 and is a publication of Victorious Publications, Grass Valley, CA - Nashville, TN. Unless otherwise stated, all scripture references were taken from The New King James Bible, © Thomas Nelson Inc., 1982. You may download this article for personal use as long as you retain credit to the author. Obtain permission before reproducing copies for any reason, by filling out our simple use permission form. Many of our writings are also available as free pdf tri-fold pamphlets, which can be downloaded for reproduction from our Online Catalog. For media reproduction rights, or to obtain quantities of this title in other formats, email us. If you have appreciated these online materials, help us reach the world with the Gospel by considering a monthly or one-time tax-deductable donation.